Shayan Khan, one of the four presidential candidates for the Sanford/Lake Mary Student Government Association elections, was declared the president-elect on Monday. Winners of the other Sanford/Lake Mary student government roles included Katelyn Wheeler for vice president and Victoria Werner for secretary/treasurer. Khan beat out her competitors with razor-thin margins. She came in with 155 votes at 39.2 percent just ahead of candidate Jasmine “Jae” Walton with 153 votes at 38.7 percent. Candidates Declan Tully-Tolmie and Eric Quintern came in with 46 votes at 11.6 percent and 41 votes at 10.4 percent, respectively. All SGA offices at the other campuses were won by default because only one candidate ran for each position at the Altamonte Springs, Heathrow and Oviedo campuses. Altamonte announced Samantha Ciresi as president, Krishna Bulsara as vice president, and Julio Auguste as secretary treasurer. Heathrow announced Betsy Prokes as president, Teona “Tina” King as vice president, and Nathan Carle-McCormick as secretary/treasurer. Oviedo announced Ashley Cheverez as vice president. She also expressed a seriousness for her newfound responsibilities. Khan is currently the president of the Emerging Leaders business club, a managerial and financial accounting tutor and a business and information management major. She has previously served as the vice president of the Emerging Leaders club, as a member of Seminole State Volunteers leadership team and as the secretary of Sigma Phi Gamma. When asked about her presidential platform, she listed three things: creating networking opportunities for students, promoting diversity in culture and unifying clubs and groups across campus. She said her main focus is on encouraging students to succeed, whether it be by helping them get a job or simply achieving their goals. She also said she enjoys helping students financially. As an international student from Pakistan, Khan said the experience of campaigning in this type of environment was new to her. When she learned that she would not be afforded an opportunity to attend the University of Central Florida, she decided to make the most of her experience by running for SGA president and by using the rest of her time to help other students. 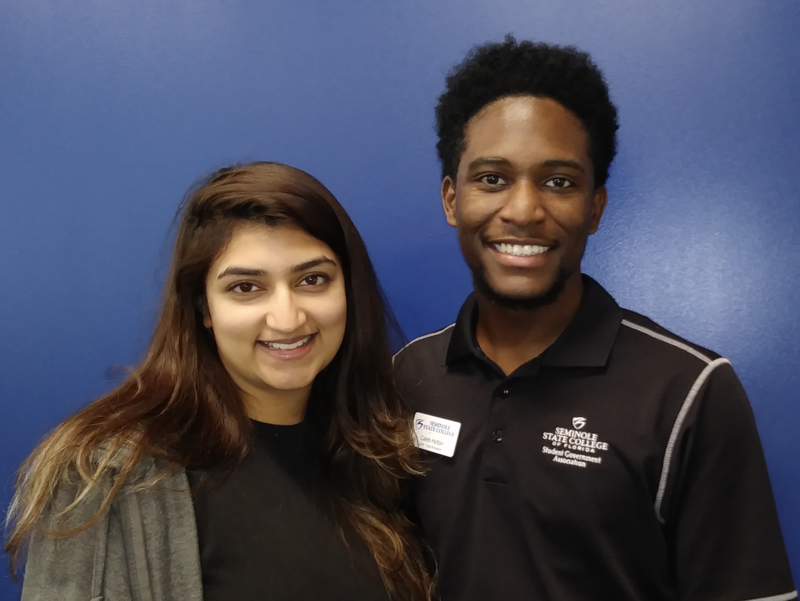 “It’s a good thing that Shayan was the one that got elected … she has a different viewpoint, a diverse viewpoint … so I think that’s going to be really important going forward,” said Caleb Hylton, the outgoing SGA president of Sanford/Lake Mary. When Hylton was asked what he thought his biggest achievement had been as president for the past two years, he mentioned speaking at events such as the Dream Gala and the new Student Center opening. There, he was able to express his gratitude for his Foundation Scholarships which enabled him to attend Seminole State College. He also exhorted the Dream Gala donors to continue their generosity for other students. However, he spoke of another accomplishment. He also mentioned that this year the SGA installed solar-powered umbrellas near the food court and gave the students $1 worth of free printing. Hylton remains president until the “Passing of the Gavel” ceremony at the Student Life Banquet that takes place April 12. In the meantime, elected candidates will get together with the current officers to discuss position duties and roles. The SGA will be recruiting new committee chairs until the end of the semester, and their team training occurs the first week in May.